The best option for handling your mortgage during a divorce depends on many factors including the loan itself and whether you or your spouse plan to live in your marital home. Refinancing during divorce is a common practice when one party would like to continue living in the marital home. In order to consider refinancing during divorce, you must be able to qualify for the mortgage with only your income and credit score. If that isn’t possible, a parent, sibling, or adult child may act as a cosigner to help you qualify for the loan. However, it’s important to note that the cosigner would be equally responsible if payments are missed and their credit score could be affected. Alimony or spousal support can also be used to help qualify for the mortgage, but only if the divorce settlement states you will continue to receive payments for at least three more years. Many lenders also request proof that you’ve received 6 months of payments and have the money to use for your mortgage payment. Let’s talk through a hypothetical situation for refinancing during divorce. Say your marital home is worth $200,000 and you still owe $100,000. That would mean you and your spouse have $100,000 in equity. If you’ve agreed to a 50-50 split, you would owe your spouse $50,000. In this instance, it might be a good idea to refinance your mortgage for $150,000 with $50,000 cash out to pay off your spouse. 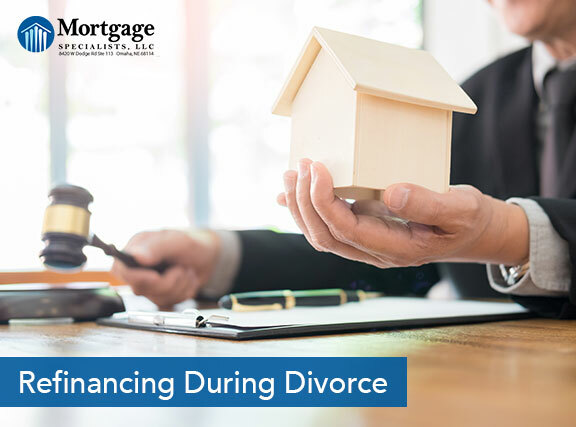 Before beginning the refinancing process, you need to make sure your divorce decree states that your spouse has agreed to transfer the title to you. If it isn’t in the divorce decree and your spouse refuses to transfer it to you, they will still own part of the house even if you’re the only one paying the mortgage. Quitclaim deeds are often used to remove spouses from titles during divorce. Most importantly, before making any decisions regarding your home, we urge you to assemble a team of divorce professionals, including a divorce attorney, financial planner, and qualified mortgage lender. Doing so will give you a wealth of knowledge to lean on when making decisions. Brent is a Certified Divorce Lending Professional. His experience and education in helping clients navigate divorce loans can help make the process as simple and stress-free as possible. Get in touch with us today by calling 402-991-5153.